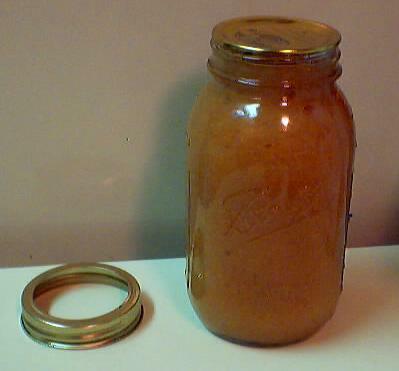 You think making and canning your own homemade applesauce is difficult or expensive? Not at all! Here's how to do it, complete instructions in easy steps and completely illustrated. The applesauce will taste much, MUCH better than anything you've ever had from a store, and by selecting the right apples, it will be so naturally-sweet that you won't need to add any sugar at all. Plus, there is no need for any additives, preservatives or chemicals. Prepared this way, the applesauce jars have a shelf life at room temperature of 2 to 3 years, and require no special attention. And of course, you can freeze the applesauce instead (it keeps indefinitely in a good freezer). UPDATE for Fall 2016: the plentiful rain in many apple-growing regions resulted in the apple crop being about bigger higher (see this page for details), so prices should be the same as last year. Advice: check our apple varieties chart to see when your favorite varieties will be ripe,and call your local orchard to confirm, so you don't miss them! And here's how you can (or in the UK, "bottle") it too. If you don't want to can the applesauce, but just want some fresh for a meal; or you don't have any food mill, food sieve, etc. see how to make applesauce for a meal (not bottling it) with NO special equipment. And once you've made the apple sauce, why not take some of it and make apple butter? You can even make sugar-free apple butter! If you'd rather make pear sauce, see this page! Finally, if you want to make chuncky applesauce, see this page. 1 Water Bath Canner (a huge pot with a lifting rack to sanitize the jars of applesauce after filling (about $30 to $35 at mall kitchen stores and local "big box" stores, but it's usually cheaper online from our affiliates) You CAN use a large pot instead, but the canners are deeper, and have a rack top make lifting the jars out easier. If you plan on canning every year, they're worth the investment. Instead, choose apples that are naturally sweet, like Red Delicious, Gala, Fuji, Winesap, McIntosh, Yellow Delicious, Mutsu and always use a mixture - never just one type. This year (2019) I used a mixture of Fuji (40%), Gala (35%), Red Delicious (20%) and Yellow Delicious (5%). If I could have found some STayman Winesap, McIntosh or Cameo, I would have added them, too. It was so sweet I did not need to add any sugar at all. And the flavor is great! The Fuji's and Gala's give it an aromatic flavor! Honeycrisp and Pink Lady are also excellent, sweet, flavorful apples (but a bit watery). Another important tip at orchards is to ask for "seconds", "culls" or "drops". These are smaller apples, sometimes odd shapes or with imperfect appearance. But there're perfect for applesauce and apple butter and uses cost 1/3 to 1/2 the price of the top grade apples. They're usually kept in the back, so you will have to ask for them. They also go quickly, so you may want to call ahead in the day to have some set aside for you. Not all orchards offer "seconds", nut they're a bargain when you can get them! You can pick your own, or buy them at the grocery store. But for large quantities, you'll find that real* farmer's markets, like the Farmer's Market in Forest Park, Georgia have them at the best prices. Last year, they were available from late September at $15 to $24 per bushel. Prices this year have been in the $18 to $30 range, most were $25/bushel at the real farmer's markets, like the Atlanta-Forest park Georgia State Farmer's Market and orchards in the southeast of the U.S. Weather and crop conditions affect the prices greatly from year to year. 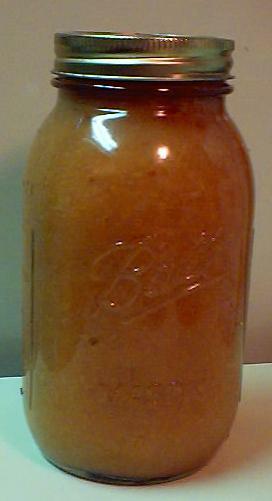 You'll get about 12 to 16 quarts of applesauce per bushel of apples. Count on 12 or 13 quarts per bushel. Now's a good time to get the jars ready, so you won't be rushed later. The dishwasher is fine for the jars; especially if it has a "sanitize" cycle, the water bath processing will sanitize them as well as the contents! 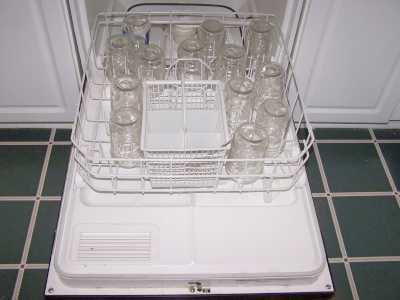 If you don't have a dishwasher with a sanitize cycle, you can wash the containers in hot, soapy water and rinse, then sanitize the jars by boiling them 10 minutes, and keep the jars in hot water until they are used. Leave the jars in the dishwasher on "heated dry" until you are ready to use them. 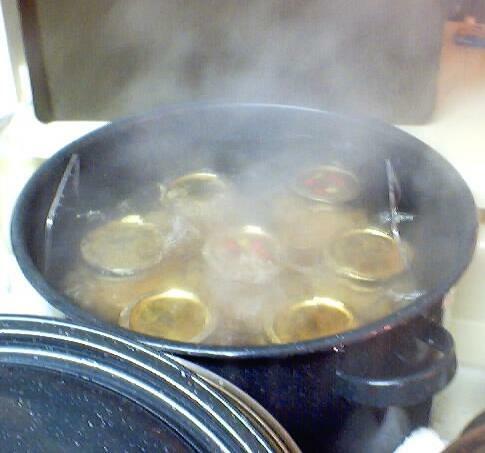 Keeping them hot will prevent the jars from breaking when you fill them with the hot applesauce. 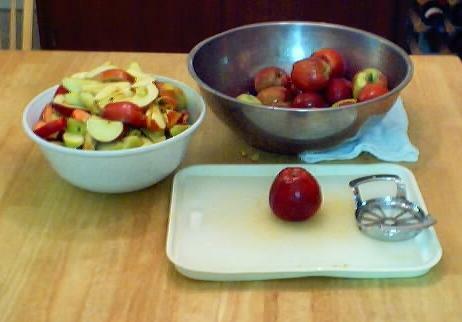 Step 4 -Wash and chop the apples! Chopping them is much faster if you use one of those apple corer/segmenters - you just push it down on an apple and it cuts it into segments. Note: You do not peel the apples! You will put the entire apple into the pot to cook. Pretty simple put about 1 inch of water (I used either filtered tap water or store brand apple juice) on the bottom of a huge, thick-bottome d pot. Put the lid on, and the heat on high. 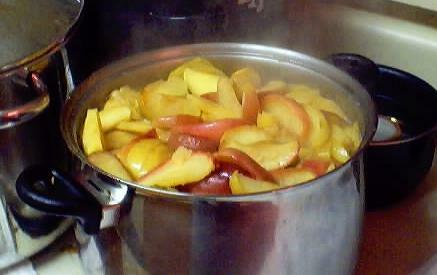 When it gets really going, turn it to medium high until the apples are soft through and through. 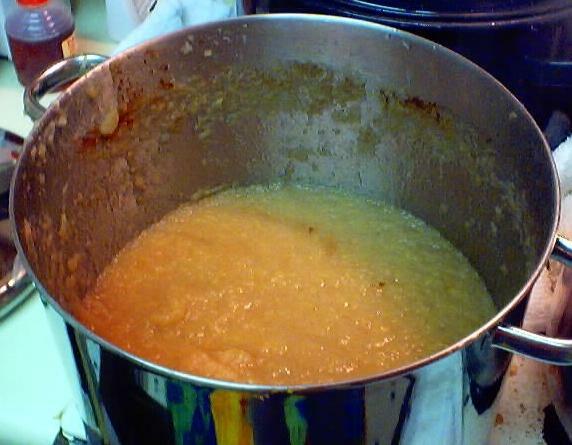 NOTE: if there is a lot of standing water (juice) among the cooked apples, you may want to ladle it off before you seive the applesauce, or your applesauce may be too watery. Be sure to save and refrigerate the juice - that is tasty natural apple juice! You can use it to cook the next batch of cut apples, or drink it! You CAN also use a simple metal sieve, but it will be VERY tedious, hard work - if you plan on making applesauce every year, spring for the 25 bucks for the foodmill. Basically, you put the cooked apples (including the skins, seeds, cores and stems) into the top hopper, and use the wooden plunger to push it in. 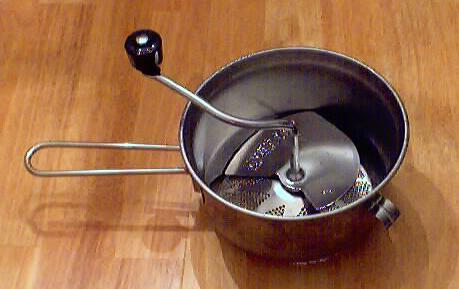 The device pushes it against a sieve and the applesauce comes out underneath (in the chrome pot in the photo at left ), and the debris shoots out the side into the sink - see photo below. If the idea of shelling out about $200 for KitchenAid, plus the additional $120 for the grinder / sieve attachment doesn't appeal to you, you can still make applesauce using a Foley Food Mill, pictured at right. You can order one here for much less than I've seen them elsewhere (see the link below the picture at right and click for more info). Obviously, you have to crank it by hand, which is ok if you have child labor and aren't making a lot. If you are only making a dozen or two jars or don't have other uses for a KitchenAid, then this is a practical alternative. Put the applesauce into a large pot. Add cinnamon to taste. You should not need to add any sugar. or about $2.11 per jar (including the jars - or $1.54 per quart if you already have the jars and just buy new lids) and as low as 75 cents per jar if you use "seconds" apples and have reuse your jars! * - This assumes you already have the pots, pans, ladles, and reusable equipment. Note that you can reuse the jars! 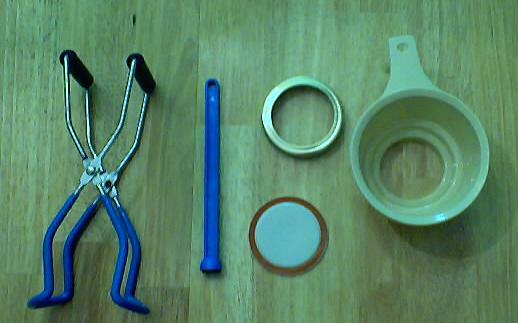 Many products are sold in jars that will take the lids and rings for canning. For example, Classico Spaghetti sauce is in quart sized jars that work with Ball and Kerr lids and rings- some authorities do not recommend these, saying they are more prone to break, and while I have found that is true of mayonnaise jars, I have found the Classico spaghetti jars to be pretty sturdy. Q. Can I use a JuiceMan or Vitamix instead of the grinder/sieve? The Juiceman will 'spit out' the pulp and seeds, but the Vitamix uses everything. This is my first time making applesauce and I really don't want to mess it all up. The Juiceman might work. If it ejects the seeds, stems and hard parts of the core, while allowing the edible apple pulp to pass through, that's what you want. Since it appears to be designed to "juice" fruit, the applesauce might be ultra-smooth; which could be either a positive or a negative, depending upon your preferences. If the apples are grown without the use of pesticides or fungicides, then the only concern is the taste, but who knows, you may prefer it with the skins ground in. You don't know till you try! Q. 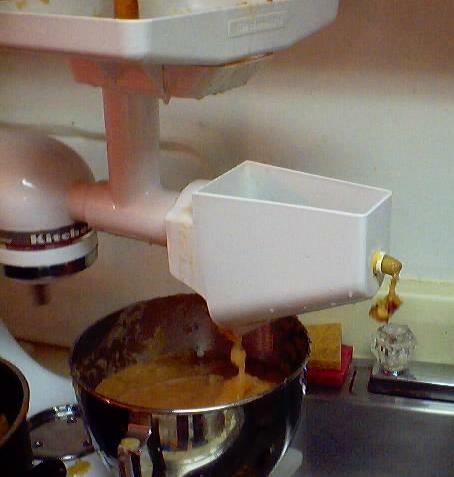 Can I use a blender for making apple sauce instead of a food mill or food processor? Certainly! Of course, you'll need to peel, cut, core and manually remove the seeds first, before you cook the apples; unless you want them all blended up into the applesauce. I get letters from people say they prefer it that way. I think I'll keep using the strainer. But sure, aside from the extra work in preparation , you can use the blender. Q. I was wondering if the applesauce recipe could be frozen and then used? Yes, absolutely! There's not much difference in flavor, applesauce cans very well, so most people can it rather than freeze, because of space limitations in their freezer. In a good deep freeze, it should easily last a year. Just let it cool to room temperature, pour it into Ziploc bags or other suitable freezer containers and pop it in the freezer! That's all there is to it! Q. I have a question about canning applesauce. Some of mine bubbled over in the canner. The lids made a good seal, however. I wanted to know if I can consider these canned or do I have to keep them in the fridge? Since they sealed and they were processed in the water bath, they should be fine! It sounds like the jars were filled too full (not enough headspace) or allowed to cool between filling and putting them in the hot water bath. Q. Have you heard of strawberry-applesauce? Can it be "canned" at home? Yes, I have made it fresh. I have not found a lab-tested USDA or University sanctioned recipe for strawberry applesauce, but since both strawberries and apples are acidic, safe to can in a water bath canner, high sugar, and pureed, I'd have to believe that a mix of the two would be equally safe. Understand, this is just my layman's estimation, not based on a lab test. If I were to can it, I'd use the recipe above and simply replace and 20% of the apples with strawberries, adding the hulled whole strawberries in with the chopped apples in step 5. Q. I made and water bathed my applesauce about 3 weeks ago. Did everything that I was told to do. But, my applesauce is turning kind of brown on the very top of the bottle. Is this a problem?" Not at all; that's fairly normal. It's just a bit of surface oxidation. It usually only discolors the top 1/4 inch or so of applesauce. It's harmless and won't affect the taste. Next year, just leave a little bit less headspace, make sure your water bath is really boiling hard, and if it bothers you, sprinkle a little bit of "Fruit Fresh" (available at most grocery stores; it's a citric acid/ascorbic acid mix) on the top of each jar, after you fill it, but (obviously) before you put the lids on. Well, the USDA and universities will argue that it was not sterile, and is risky. 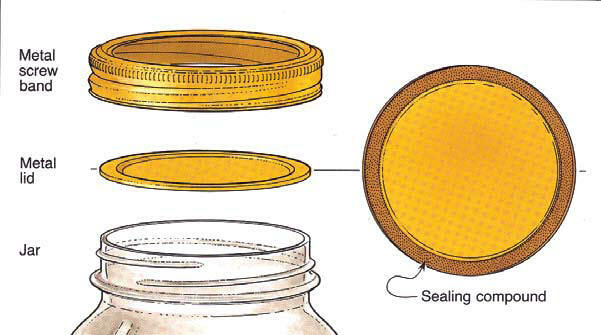 The sealing was due merely to the cooling of expanded heated water, but is completely unrelated from any assurance of a sterile condition. I think you will find that the rate of spoilage could be high compared with water bath processed jars of applesauce. The risk of botulism still exists. And since botulism spoilage has no taste, color, odor or gas, it is undetectable at home. In short, I'm afraid that there is no answer without lab testing your jars. Some families routinely can without processing, but I don't think I'd take the risk. See this page for more information. 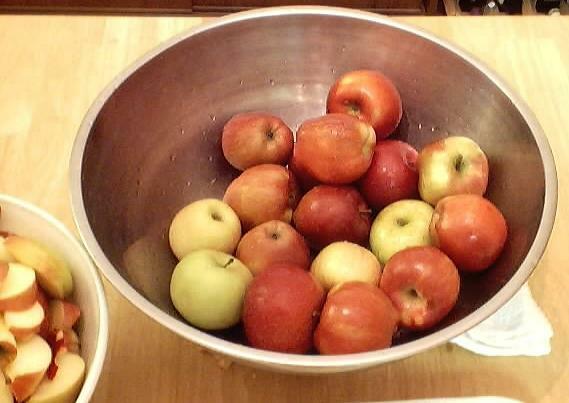 2. peel, core and segment your apples, cook them (apart of the too-thin applesauce) until soft in a 1 inch of water. Then drain off the liquid and add the solids to your applesauce. The liquid makes good drinking apple juice. Of course, cooking the unpeel chopped apples and then using the food mill gives you the ability to ladle off excess juice before your mush and sieve the apples. Foley food mills (see on the applesauce instructions page) are usually about $24 and well worth the investment. And yes, you could always use the applesauce to make apple butter! Thickening applesauce - A visitor writes on September 29, 2013: "I have just made another batch of applesauce following your instructions. I love it and it's so easy this way. 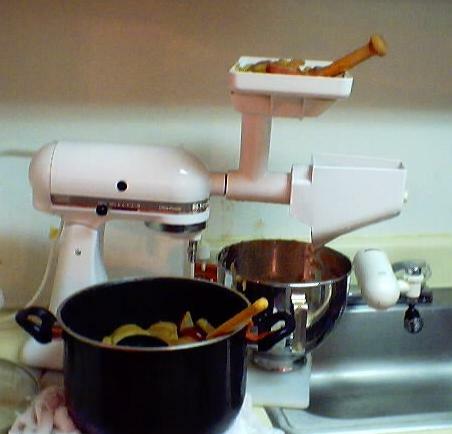 I just wanted to pass on something that I do when running the cooked apples through my Kitchen Aid food mill. 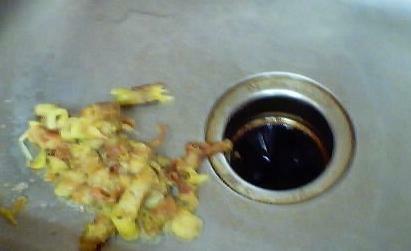 I actually take the discarded pulp and run it through again. It comes out really dry in the discard bowl and extremely thick in the apple sauce bowl. Then I stir that in with the rest of the apple sauce and it makes it thicker. I just thought you might find that useful. A visitor writes on July 03, 2013: "Just made your applesauce recipe (because I'm making your apple butter recipe tomorrow) and holy moley, it's the best applesauce I've ever had! So easy too! I'm going to have to buy a bunch more apples and make a ton of it for my kids to eat!" A visitor writes on October 18, 2012: "First, I would like to say I love the canning information you guys have on your site. Very informative and helpful. I came here looking for help with canning applesauce, but I've been really enjoying the depth and quality of your information. " A visitor writes on November 23, 2011: "I just wanted to tell you how much I have enjoyed your site. A few weeks ago, I was looking for a delish applesauce recipe and happened upon your site, which I had never visited before. Since then, your site had popped up in searches for several things and I am always tickled to see what you have to say. Today, for a homeschool "Thanksgiving" unit with my kids, we did several things with a pumpkin (guessed it's weight, then weighed it; guessed if it would float then put it in the pool to see...lol; etc) and finally roasted the seeds and "cooked" the pumpkin for puree...and so I found myself in need of a recipe for Pumpkin Bread...alas, your site came up yet again and I knew I was on the right track. I look forward to making the pumpkin bread tomorrow FOR Thanksgiving!! Thank you so much for what you do!!! ~Jess~"